October 21: Dan Meyer explained how a new Desmos activity embodied their design principles in a post titled "Marcellus the Giant." October 22: A number of people shared a link to a PDF titled "60 iPad and iPhone Apps for the Math Classroom." It's not listed, but I'll plug PhET Interactive Simulations, a CU-Boulder project with some math simulations that recently became available for iOS. October 23: Sunil Singh's post "Stop Selling Math For Its Usefulness" reminds me of why I think it's so critical for math educators to take a course or otherwise study the perspectives of mathematics and math education. How we define mathematics for our students, and the approach we take in helping them learn mathematics, directly shapes their perspective of math and its utility. And just as this post advocates one of several perspectives, students need multiple perspectives, too. As a first-grade teacher, I lived in Literacy Land for the first thirteen years of my career. Nearly all primary-grade teachers live there. It’s a great place to be; learning to read, write, and comprehend is critical. Sure, we took day trips to Math Land, but it was less comfortable for us as teachers. We weren’t really sure where Math Land would take us next. We had heard that the older grades were throwing math parties,* but we weren’t invited. So, we just kept to ourselves, doing what we thought was best: using manipulatives and modeling for students in whatever way we (or the publisher’s curriculum) thought they should solve problems. October 25: NCTM President Matt Larson announced a significant new initiative aimed at high school. With a working title of Pathways through High School Mathematics: Building Focus and Coherence, NCTM plans to look carefully at the purpose of high school math, define curricular pathways that lead to college pathways and career readiness, and describe exemplar courses. October 26: It's been a while since Ben Orlin entertained this blog with one of his comics, but here he is again with "The Student-to-Teacher Dictionary," in which Ben promotes an optimistic perspective on things students say that often come across as negative. October 27: Joe Schwartz gave us a "Frowny Face," a short post about an oddly (poorly?) specific estimation worksheet that caused a student frustration and how he resolved it. The last day to vote for NCTM Board of Directors is Monday, October 31! If you're a member you should have a link to your ballot in your email. Don't miss Matt Larson's high school announcement people were sharing on the 25th, mentioned above! I think this is a big deal and I'm most interested in seeing where it goes. Following the #NCTMregionals tweets from this past week will give you the latest from Phoenix, where math educators gathered for NCTM's Regional Conference. 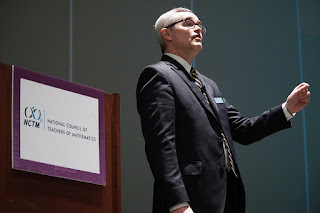 Next week NCTM will host a regional in Philadelphia before catching its breath and hosting Innov8 later in November. If you want to catch up on the Ignite sessions from Phoenix, Suzanne Alejandre has the Storify right here. NCTM has an impressive number of grants available courtesy of the Mathematics Education Trust. If you've ever needed money for attending a conference, purusing some PD, or doing classroom research, there's probably a grant that fits your needs. Applications for this round of funding are due November 4th. The Global Math Department welcomed Gail Burrill last week for a talk about calculus, and next up is "Children Living in Poverty Can Solve CCSS OA Word Problems" by Karen Fuson. Tuesday, November 1st is the deadline to nominate someone for NCSM's Taylor/Gilbert National Leadership Award. Please reply to the survey by November 13!